Just imagine this impact — for every test drive, a car dealership donated $10 to a kid in need. For every ice cream cone sold, a child got a new backpack. How about for every air conditioning service call this summer a child got a new pair of sneakers? Or for every new house built this year, an entire classroom receives a full compliment of school uniforms and school supplies. What if for every apartment leased this year, $1 was donated to to buy a child his very own books. Finally, what if for every hamburger purchased on a Tuesday at your favorite spot, $3 goes to support Valley school children. Do you think that would make a difference? Do you remember your first day of school? The excitement you felt showing off your new clothes, cool sneakers, and backpack? Well, that’s not what it’s like for Shaquille and the 25,000 kids just like him that we serve each year. You see, they face embarrassment and ridicule just because their families cannot afford new clothes. Instead, they must put food on the table and pay this month’s rent. Shaq, shows up at school wearing the one shirt he owns, worn-out shoes, and you can forget about a backpack. For five decades, Back to School Clothing Drive has helped break down barriers to early childhood school success by providing new school uniforms and outfits, backpacks and school supplies to K-6 grade students who desperately need them. These children whose family are living at or below the federal poverty level (approximately $30,000 annual income for a family of four) attend Title 1 public elementary schools throughout the Valley. Our products are school uniforms, but what we deliver is selfesteem, self confidence, and a successful start to school for Shaq and thousands more just like him. School officials and teachers report that if students do not have uniforms, they often stay home since they know they are required each day. Parents confirm they are embarrassed to send children to school without appropriate attire. The U.S. Department ofEducation says partnerships between schools and social service agencies are vital to student success. Our successful partnerships span more than 260 schools and 40 school districts. That’s quite an impact! The Arizona Education Association reports Arizona has cut kindergarten-through-12th-grade funding by more than $1 billion since 2009. Undoubtedly, cuts that deep affect everyone, but they’re lethal to the low-income families who can’t afford to make up the difference. Over the years, these families have relied on Back to School Clothing Drive to ensure their children have the clothes and supplies necessary for a good start to each school year. 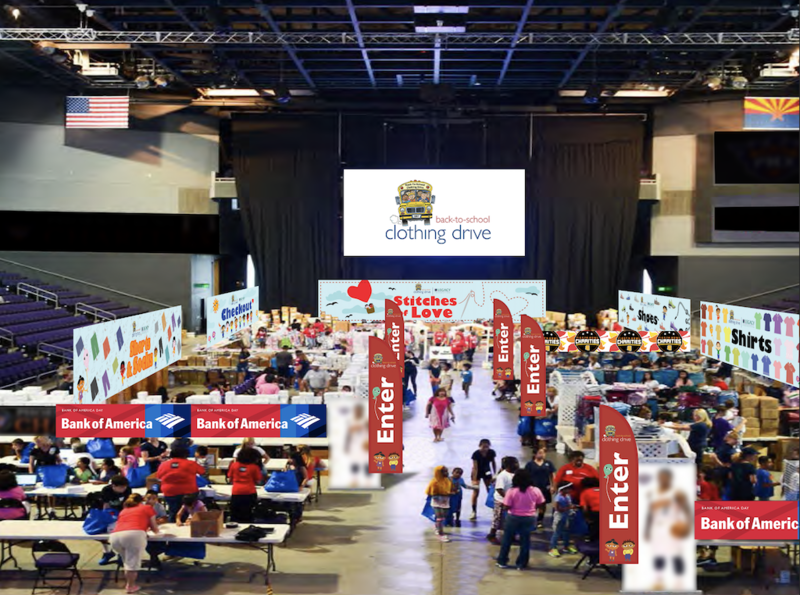 BTSCD offers help through two signature programs: “New Clothes, New Beginnings” clothing distribution and “Student Attire for Education (SAFE)”. Our services are simple yet effective, and they positively impact the student, family, school, and community. Our teachers and districts confirm that whenstudents have clean clothes to wear and grade appropriate supplies to use, it greatly reduces absenteeism. And research shows that consistent attendance in elementary school leads to lower dropout rates in high school. 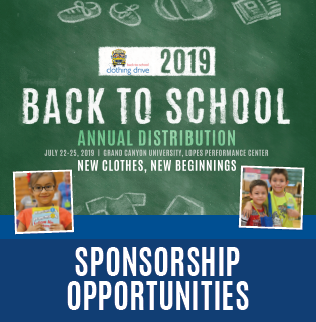 The New Clothes, New Beginnings Annual distribution is our signature program in collaboration with the BHHS Legacy Foundation Backpack Buddies program. 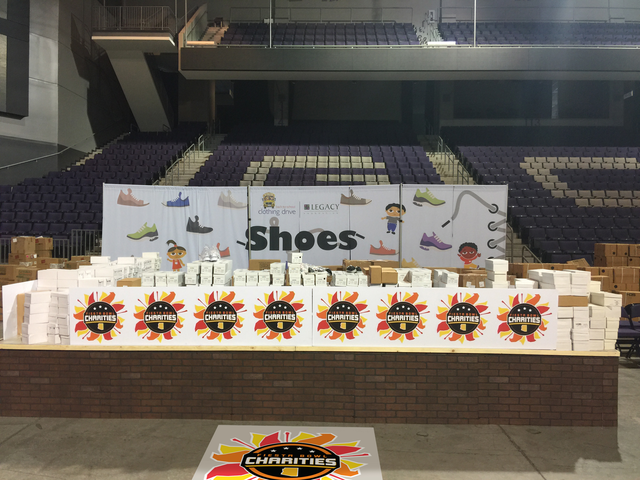 Held at the Grand Canyon University Arena, this annual clothing distribution benefits approximately 10,000 K-6 grade students from 140 Title I public elementary schools. Each child receives approximately $350 in clothing and school supplies to help prepare for the school year. Over 2,500 volunteers, significant media exposure, and strong corporate support makes this a signature event for Valley students each summer. 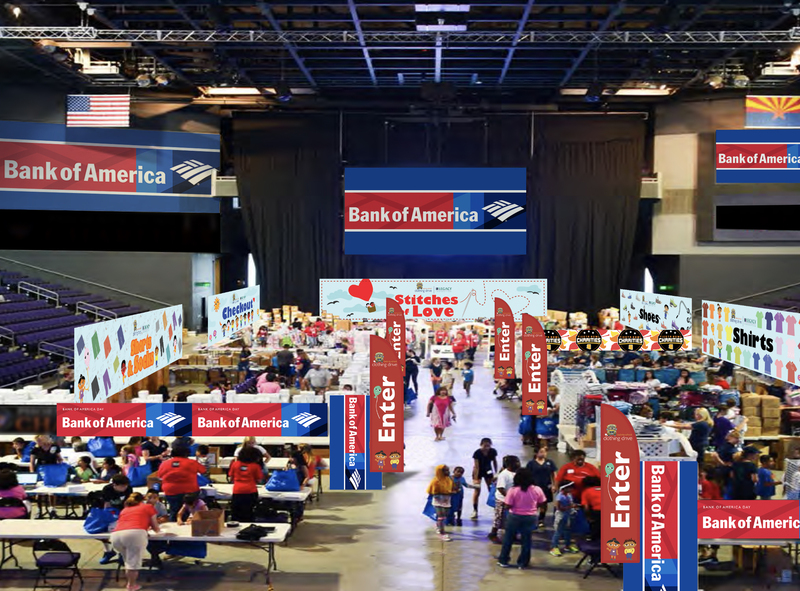 Impact: Approximately 10,000 students benefit; $1.8 million in clothing and school supplies distributed. The departments are the center of it all! It’s where the students get exactly what they need to be dressed for success! Available departments include: 1) Shorts, 2) Shirts, 3) Shoes, 4) Backpacks, 5) Socks & Underwear, 6) Quality Control, and 7) Stitches of Love. The Learning Zone is where the kids go when they aren’t shopping. Bustling with activity, there are many different hands-on learning opportunities. Throughout the week, 2,500 volunteers will be on site working making the need for a break room essential. With over 140 schools participating in our annual event, there is bound to be a school that is within your small business service area. Do you or your family want to help others in need and want to volunteer as a family? This is the perfect opportunity to give back as a family to other families in need. The SAFE program helps schools stock their onsite clothing closets. Funding is generously donated by the Gila River Indian Nation, BHHS Legacy Foundation and others. These items are made available throughout the year through member Title I schools. School coordinators distribute to children whose parents cannot afford school uniforms. Impact: Approximately: 10,000 – 15,000 students annually. 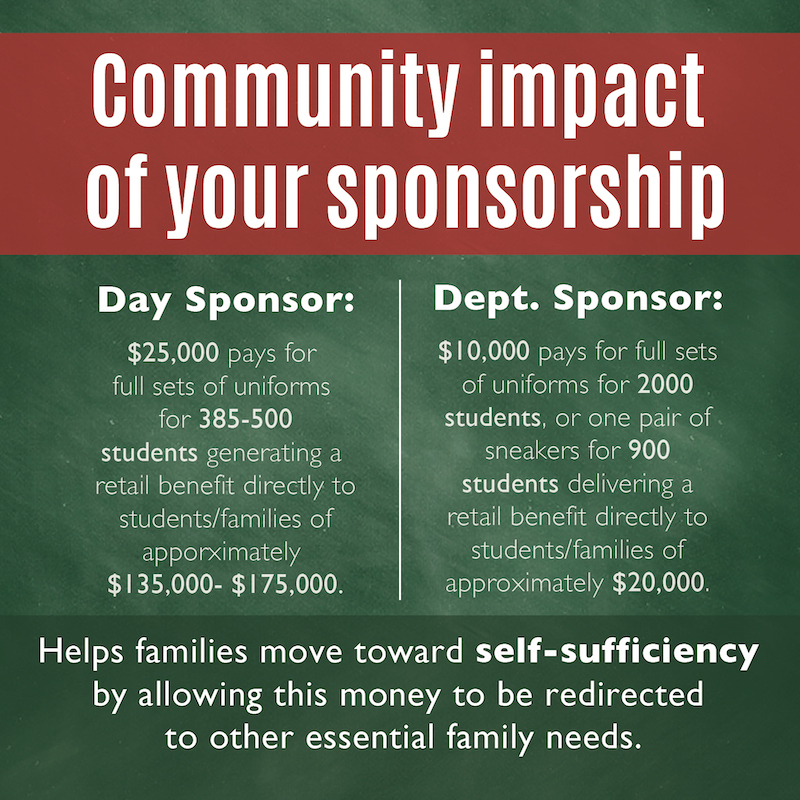 Approximately 100 students benefit from each school purchase. Stitches of Love recruits, organizes, and supports more than 100 passionate volunteer seamstresses and crafters in providing unique clothes and accessories for needy children in the Valley of the Sun. The volunteers spend all year making clothing so that our students can start the school year with something that was made just for them. Goal: $2 Million. For more than 50 years Back-to-School Clothing Drive has helped Arizona’s highest need families. Through our signature programs, New Clothes, New Beginning Annual Distribution, and Student Attire for Education (SAFE) Matching Grant and Online Retail Store, thousands of parents don’t have to choose between buying their children school clothes and supplies or buying food. Our services are simple yet effective, and they positively impact students, families, schools, and communities. Today, we are focused on building a future that will allow us to serve more children each year. We are focused on building a future that will allow us to serve more children each year. We will increase the number of children we serve through New Clothes, New Beginnings. We will expand our SAFE online clothing store to allow individuals to purchase school uniforms through the program on a buy one give one basis. When one school uniform is purchased, one will be given to a child in need through our summer program. We will also expand out matching grant support to local schools throughout the Valley and across the state. This expansion is a critical step in our growth, as all proceeds from the store are used fund additional SAFE matching grants. The more uniforms we sell, the more students we can help. It is an exciting time! By working together we will eliminate fundamental barriers to early childhood school success. Back to School Clothing Drive is uniquely positioned to lead the charge.